Our review copy of A Fistful of Penguins was kindly supplied by Wattsalpoag. So there we were, walking through the halls of Essen. Actually, we had just entered, and we were looking through the giant list of things we need to see. Suddenly, through the crowds, we saw the, and we knew this would be our first game to try. We’re the Meople’s Magazine, if you want to attract our attention just put up a big pile of meepluins (that’s penguin meeple – I’ve fallen behind on my quota of meeple neologisms and am now afraid for my Christmas bonus). And that’s how A Fistful of Penguins became the first game we tried in Essen this year. A Fistful of Penguins was a great game to start Essen with: it’s very light, perfect to play before the second cup of coffee – the only thing that can be done before the first cup of coffee is brew the first cup of coffee – and it has translucent pink and yellow penguin meeple. It also has a bunch of animaltastic custom dice, because rolling dice with numbers is getting old. These dice show penguins, squirrels, kangaroos, lions, camels and moose, and all of them follow different rules. Lions are quite straightforward: each lion is worth $7, but if you score your lions then you cannot score your moose, squirrels and kangaroos. Camels are even more cowardly than that, they only score their $5 when none of your dice is showing a lion. Moose are a bit lazy, on their own they score nothing, but together with a squirrel they are worth $9 – any relation to Rocky and Bullwinkle is purely coincidental. Squirrels are also thieving little buggers: the first one steals $1 from the player to your left, the next steals $2 from the next player and so on. Last but anything but least in the scoring department are kangaroos: they score the total number of kangaroos in your roll squared. 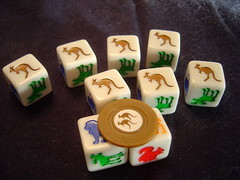 Kangaroos also grant you the mystical kangaroo chip that lets you turn one or two dice to the kangaroo side during the next round. Penguins are special, they don’t give you any money, they award the ubercute meepluins. Just like kangaroos, rolled penguins become more valuable the more you have. But why would you want the meepluins? Ok, wrong question, why wouldn’t you want the adorable things? But what advantage do they have in the game? A huge one, actually: they let you buy more dice and reroll them until they suit you. A Fistful of Penguins is as simple as can be: it plays in three rounds, the first round each player starts with four dice, the second with five and the third with six. When it’s your turn, you roll the dice once – and if you don’t have any meepluins that’s all you do. Fortunately, you always start with a small fistful of those, and now you can use them to buy more dice and reroll all dice that are not to your liking, until you have a collection of dice that you think scores the maximum of points. And that’s where the problem with A Fistful of Penguins‘ scoring comes up: when you have enough penguins to make it happen, nothing beats a roll of nine kangaroos for $81. 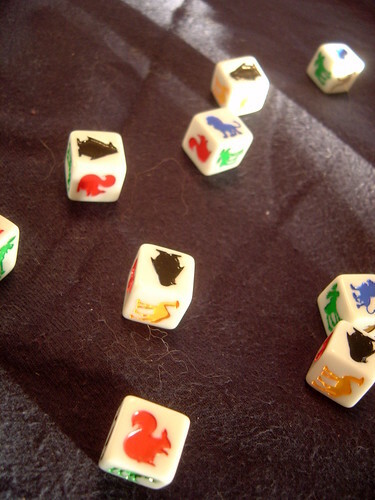 In the last round, you need three penguins to buy the remaining dice and use the rest to reroll until you have 7 kangaroos showing, the final two you create with the magic kangaroo chip you should have from round two. And so, barring really horrible luck with the dice-rolling, the game boils down to getting the right amount of penguins on round two: not too few, because you want to reroll a couple of times, not too many, because leftover penguins score worse than rolling just about anything else. And your dice luck needs to be really horrible in order to fail with this strategy – even Niko managed to win a game, and he’s widely accepted as the worst dice roller that ever existed. The advanced rules try to fix this scoring problem and add more interaction at the same time: the current player rolls as before, but every other player now also gets to roll a dice and put a price on it: any amount of money plus up to two penguins. Instead of spending one penguin for every additional dice, the current player now has to decide whether he wants to pay the other players’ prices or not. The variant does spice up the game – my first instinct was to make my die so expensive that no one would want to buy it, taking away their the chance to score. But it turns out that a well-priced die can actually be more profitable, a winning strategy for the advanced game is not as easily found. A Fistful of Penguins will not keep seasoned gamers entertained for very long, but in the advanced variant it’s a good game to fill the gap while you’re waiting for the other group to finish their game, and the basic game is amazing to play with kids – just be nice to them and don’t go all-kangaroo until they’re old enough to figure out that strategy themselves. Next Post:Meople News: Rise R’lyeh!